Social interaction with people we both know and don’t know is a major part of our lives – both personal and professional. In our private lives, it has become extremely easy for us to know what other people are doing. While we can argue the impact of missing a friend’s dog’s birthday, failure to connect and interact with the people we work with has multiple (and serious) consequences. For many of you, your customers, partners and competitors are not just local anymore. Your work today is a constant, complex competition in the global market with a single objective – delivering the right products faster and cheaper. Interacting and collaborating with all of a project’s stakeholders anywhere in the world–and at any time–is imperative. The conceptual phase of product development is when innovation usually happens. This is the time when you and the team are the most creative, trying to resolve all of the challenges in front of you. It’s even more critical to be connected and collaborative during conceptual design, as decisions (right and wrong) are made at this time. They have direct implications on the cost and ultimate success of your product. 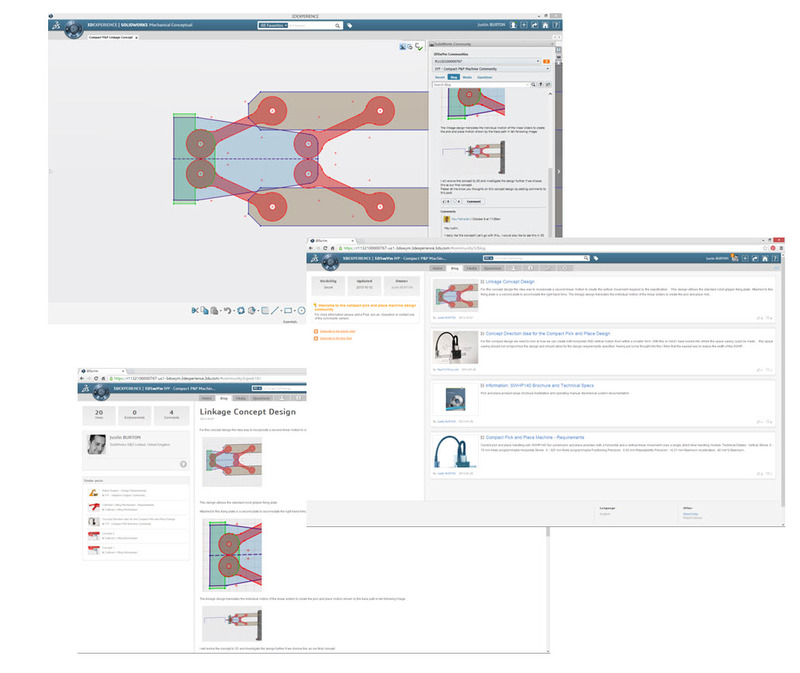 Whether you need to collaborate during the sales process with many different prospects, need to select the right partner to work with, or just need to share the project details with your management or marketing team, SOLIDWORKS Mechanical Conceptual provides you with a secure, instinctive and interactive collaborative environment. You can easily share ideas, facilitate innovation, and capture and manage requirements, feedback and comments from everyone involved. As an integral part of your SOLIDWORKS Mechanical Conceptual solution, you can create unlimited numbers of communities where YOU control who can participate. These are safe and controlled environments where you can have focused interaction and collaboration on multiple projects with multiple stakeholders at the same time. Blogs, wikis, iQuestions are just few different ways of fostering social innovation inside communities. 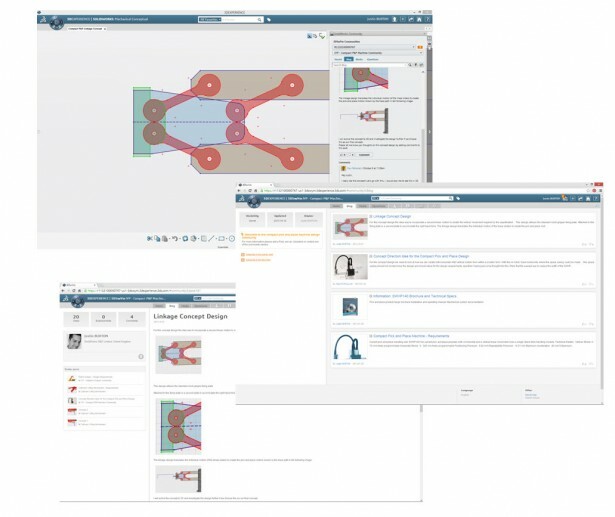 Social innovation as a part of SOLIDWORKS Mechanical Conceptual provides you and other team members with a fully embedded, instinctive way to seamlessly collaborate while working on your concepts at the same time. Other people from all over the world, using just a Web browser, can access communities and engage in your product development and conceptual design activities as well. 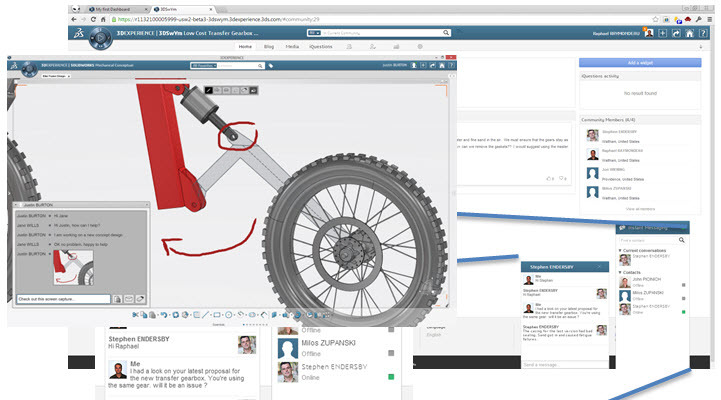 For more dynamic collaboration you can use real-time, instant 3D messaging that is seamlessly embedded inside SOLIDWORKS Mechanical Conceptual and accessible through a Web browser. Social innovation lets you engage your project stakeholders early, share innovations with your customers, and capture feedback quickly, helping you drive your conceptual design in the right direction early and giving you competitive edge in the market. 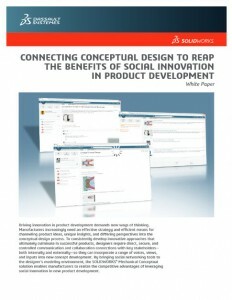 To learn more, download our whitepaper on Social Innovation.